New Infiniium UXR-Series oscilloscopes include models ranging from 13 to 110 GHz of true analog bandwidth. Keysight’s Infiniium UXR-Series enables high-speed serial and optical designers, focused on current and next-generation technologies, to quickly create comprehensive designs with higher margins, thereby reducing time to market of their innovation. Superior performance levels, combined with a wide selection of bandwidth choices, make the Infiniium UXR-series the ideal solution for engineers and designers working with any generation of DDR, USB, PCIe or other serial technologies, as well as PAM4, 5G, radar, satellite communications, and optical designs. 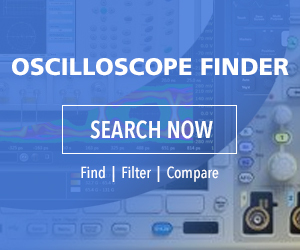 Keysight’s Infiniium UXR-Series delivers a low noise floor and high vertical resolution to ensure measurements are not impacted by oscilloscope noise and signals are represented accurately. As a result, eye diagrams are significantly more open, and true margins and performance can be determined. 10-bit vertical resolution and industry-leading signal integrity for superior effective number of bits (ENOB), leading to faster compliance testing with higher margins. sampling rates of 256 GSa/sec per channel on 40 to 110 GHz models and 128 GSa/sec per channel on 13 to 33 GHz models, creating an accurate reconstruction of high-speed signals. up to four full-bandwidth channels with less than 35 fsec (rms) of inter-channel intrinsic jitter providing accurate timing and skew measurements. an optional full factory grade self-calibration module which ensures ongoing measurement accuracy while reducing the need to take the unit out of service. Keysight also announced two additional solutions that, when paired with the company’s Infiniium UXR-Series oscilloscopes, offer a full end-to-end solution from stimulus to analysis for PAM4 and 400G, 600G, as well as terabit coherent optical interconnect designs. N4391B Optical Modulation Analyzer (OMA) –a compact, real-time oscilloscope-based OMA designed specifically for complex optical data transmission and terabit measurement challenges. M8194A 120 GSa/sec arbitrary waveform generator (AWG) –Keysight’s fastest AWG delivers a new level of stimulus performance for generating challenging formats such as 64 GBaud 64QAM (quadrature amplitude modulation) and other wideband modulation schemes. More information about the Keysight Infiniium UXR Series real-time oscilloscopes is available at www.keysight.com/find/UXR. More information about the Keysight M8194A AWG is available at www.keysight.com/find/awg_backgrounder. Keysight Technologies, 1400 Fountain Grove Parkway, Santa Rosa, CA 95403, (800) 829-4444.